Wrapping up Diablo's presence at BlizzCon, the World and Q&A panel dove into the lore of Diablo and gave a preview of some of the abilities the classes will use in Diablo Immortal. Wyatt Cheng, lead designer, prefaced the panel by saying that the development team hears fans in regards to some of the negativity surrounding the Diablo Immortal reveal, and stressed once more that there are multiple Diablo projects in development. Here's what went down. Matthew Berger, senior designer, dove right into the lore of Diablo, starting with a timeline of the universe, ranging from the creation of Sanctuary by Lilith and Inarius using the Worldstone on one end and the End of Times at the other. Berger then highlighted the various archangels and demons throughout the games. With Diablo Immortal we learn some pieces of the Worldstone survived. They're corrupted, and if those pieces fall into the wrong hangs it could be bad news. Skarn, the Herald of Terror and Diablo's lieutenant, who's purpose is to bring his master back to life, is the main antagonist. 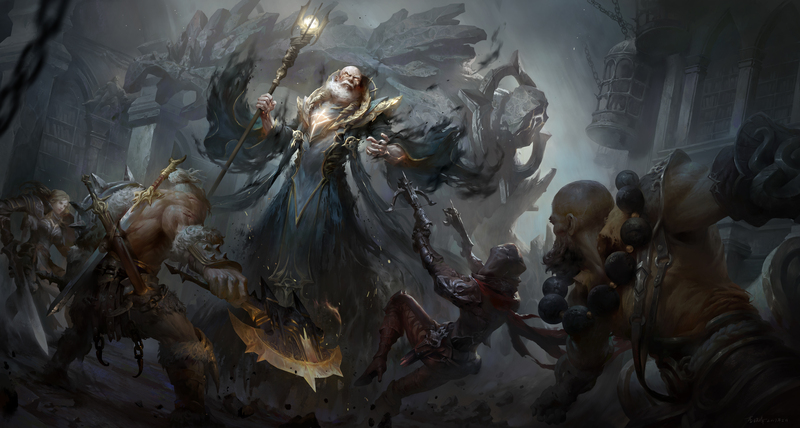 Diablo Immortal takes place five years after Lord of Destruction and 15 years before the beginning of Diablo 3. Bilefen — swamp, bog environment. Corrupted Worldstone fragment is corrupting surrounding area. Zoltun Kule's Library — The wizard has a number of caches throughout Sanctuary, and this one is different from the archives of Zultun Kule in Diablo 3. Library is guarded by a curator, which is actually a copy of Zoltun Kule who doesn't realize he's a copy. Four player dungeons made for a specific, crafted experience. Monsters stay dead inside the instanced dungeon, and there are mechanics inside dungeons that aren't available in outdoor zones. Kikuras Rapids — ride a raft and make your way down the rapids, described as a theme park water ride with monsters trying to kill you the whole way. Forgotten Tower — area from Act 1 of Diablo 2, home of the Countess. Cultists have found a way to resurrect the Countess. The panel continued with an overview of each Diablo Immortal class, as well as a preview of their skills. Too early to say if Mephisto will be in Diablo Immortal. Game will explore how some of the Prime Evils are returning faster than they should. Currently looking at what itemization will look like in the game. Legendary powers will definitely be a part of it. Also looking at how to upgrade and improve items over time. Socketing will be part of items in some form. Haven't figured out business model. Focusing on making an excellent game first. When the game is farther along will figure out what the right business model is. On topic of keeping Diablo relevant in the face of competing action-rpgs, team is more concerned with making an excellent game. Team thinks there is some middle ground between no trading and the auction house in regards to trading in Diablo Immortal, but no specifics to talk about yet. Big time frame that Diablo Immortal deals with lore wise. Formation of Demon Hunter order is one storyline that will be explored in the game, and room for more of those stories to be explored in the future. How about.. Talk about the other projects while they can? Push Immortal to C-block and get a bigger team, focus on PC.. ? How about that? Well, they did hint at "expanding" the mobile game with additions, I bet if you are a Witch Doctor player you have to pay even more money.